(Bloomberg Opinion) -- Why are U.K. markets so stable when literally anything can still happen over Brexit? Monday’s ruling by the House of Commons speaker that a third vote on Theresa May’s withdrawal deal cannot be put before Parliament without big changes looks to have lowered the chances of it being approved before the March 29th Brexit deadline. But it hasn’t prevented it definitively. If a deal passes at the eleventh hour, then sterling would probably soar. Similarly, if a cliff-edge Brexit happens (even if it’s an accident), the pound will plunge. 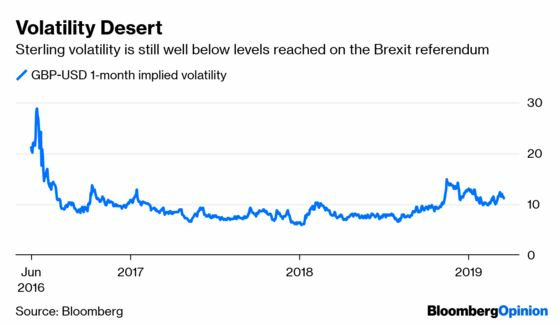 Since John Bercow’s dramatic intervention, most traders are betting on a long extension to the Brexit process, which would probably see the pound continue to trade within a tight range — that is, without much volatility. The bookies agree. According to Oddschecker, the odds of a no-deal Brexit is a wide 6/1 and an extension of the departure date into at least 2020 is pretty much even money. This seems a little complacent, given that the EU’s 27 other member states need to be unanimous on agreeing a delay. Without one, we’re staring at Britain crashing out without a deal at the end of next week. The markets might also be under-pricing the chances of May’s deal making it through. She has been a pretty disastrous steward of the Brexit process, but no one can doubt her almost masochistic determination to finish a task. 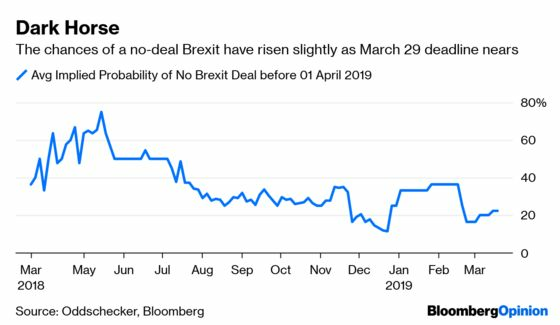 So one possible Brexit trade is a wager on volatility: A long extension would probably signal yet more stagnant sterling markets, but a no deal or a May deal would almost certainly lead to a spike in either direction. Most commentators reckon a hard Brexit on March 29 (or after a short extension) would push sterling down to 1.20 versus the dollar. Likewise, it’s likely that an approved May deal would see the pound soar above 1.40. If you feel the need to explore your inner markets wonk, my Bloomberg colleague Tanvir Sandhu has written on how the U.K. gilt market has become a range-bound prisoner. Yet a clear and quick U.K. departure from the EU, whether with or without a deal, could well upset the low volatility apple-cart that has prevailed across virtually all asset classes globally. The three big reasons for the becalmed environment are: Brexit, the Federal Reserve’s decision to hold off hiking rates further, and the outcome of U.S./China trade talks. Once the dam breaks on one of these, it could trigger knock-on moves worldwide. A long delay to Brexit wouldn’t shake up the volatility indexes too much. But the potential rewards for a breakout moment are much greater than the meager returns from being short volatility on U.K. currency, debt or equity. It’s a brave move, but as Bercow proved this week, Brexit is still capable of providing shocks.